Stemcentrx methodology breakdown summary diagram. Like President Nixon in 1972, President Obama has just announced the new strategic goal – a “cancer moonshot,” to “cure cancer once and for all”. The goal is to find a single drug or new technology to cure cancer without radiotherapy or any other side effects. Successful accomplishment of this goal will save millions of lives around the world. Every year around 14 million people worldwide learn they have cancer, and 8 million people die from the disease. In the US from 1950 to 2005, the percentage of people people being diagnosed with cancer has only dropped five percent per capita. That said, the mortality rate has dropped 26 percent per decade for the youngest groups and 6.8 percent per decade for the oldest between the years 1950 to 2008. Peter Thiel is known as the first outside investor in Facebook, cofounder of PayPal and present head of the investment firm Founders Fund. His group has recently invested $200 million in Stemcentrx, a private company in San Francisco developing cancer drugs. This is the largest ever bet on a startup biotech company. The Stemcentrx main approach to cure cancer is targeting naturally-occurring stem cells that may be pre-cancerous in the body. Discovered in 1960, stem cells offer new options for treating diseases such as heart disease, diabetes and cancer. Pluripotent stem cells can divide into more stem cells or can become any type of cell in the body. The stem cells self-renew within the damaged part, promoting growth of new tissues and subsequently replacing the diseased tissues. However, there are many unexpected side effects: when such cells are injected into patients, they can produce tumors from rapid growth of unrelated types of cells, spontaneous cells. Stem cell treatments are still in the research phase, and it is important to understand how stem cells become specific cell types and to find a way to control this process. While we hear about tumors as a side-effect of some forms of stem cell therapy, a similar issue may occur with stem cells that develop in the body naturally. At Stemcentrx, they believe that these natural stem cells are the origin of different common cancers. However, their hypothesis that cancer is caused not by any spontaneously growing stem cell but only by rare specific stem cells is not commonly accepted. Thus, the company is focused on identifying the cancer-inducing stem cells via a unique molecular marker for such cells. Confirming evidence has been found so far for leukemia, breast cancer, and lung cancer stem cells. In their experiments, they inject human cancer cells under the skin of lab mice. The growing cancer tissues are then further divided with different types of cells, which are then tested using other mice. The procedure is repeated until one type of cell (the cancer stem cells) is identified which is as capable of tumor creation as the original sample. One very expensive issue with most pharmaceutical development is that genetic differences between mice and humans. A billion dollars may be spent finding a drug that shows promise in lab animals, which then fails completely in human trials. 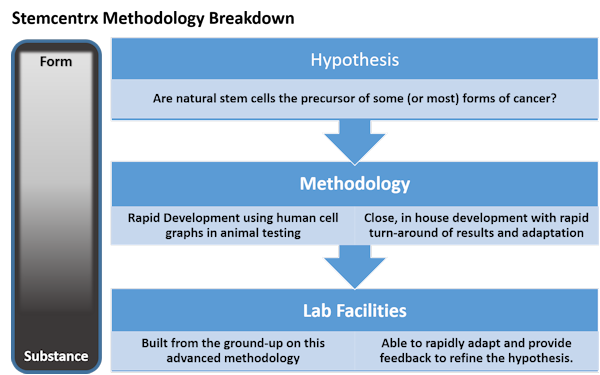 By using human cancer cells at the lab animal phase, Stemcentrx is avoiding this misinformation almost completely. This will both speed development and avoid wasted investment in therapies that do not translate to patients. One of the main challenges of biological and biotechnology studies is “randomness”. There are too many factors affecting experimental results. Almost all drug development must work with very poor signal-to-noise ratios, and therefore must expend billions of dollars and many years to demonstrate reliable results. Stemcentrx is attempting to use rapid-development technologies to eliminate as much noise from the development process as possible, and therefore increase both human health options and return on investment by shifting probabilities. According to investors, Stemcentrx was designed “to get these probabilities as close to one as possible at every step, to get rid of as much of this randomness or contingency as possible”. Key investors give Stemcentrx a high probability of success, because the Stemcentrx cofounders Brian Slingerland and Scott Dylla have unique and enormous potential and complementary skills. Stemcentrx has already demonstrated very promising early clinical results for an antibody drug. This drug was shown impacting stem cells that appear to cause small-cell lung cancer in a study with 80 people. A larger study with this drug is planned. Presently, they are running clinical tests using three drugs they have developed. Stemcentrx working hypothesis, that destroying relatively rare cancer stem cells leads to completely combating the cancer, is showing promise with some cancers so far. However, there are critics who debate the stem-cell theory based on some experimental results. One convincing case came from skin cancer studies. It demonstrated that about a quarter of melanoma cells from humans were able of induce cancer without a special, rare stem cell. To validate the scope of the cancer-stem-cell theory, more clinical trials are needed with different types of cancer. Many books have been written on entrepreneurship, including one from Peter Thiel. One key aspect promoted in Guy Kawasaki’s Art of the Startis to have two founders with complementary skills. This is originally based on Guy’s experience with Apple (Steve Wozniak and Steve Jobs), but could be applied here to Brian Slingerland and Scott Dylla. Peter Thiel, with his background from the software industry and interest in life extension technologies, is the ideal investor for a company that seeks to use accelerated development methodologies from rapid growth industries and pair it with the slow and noisy traditional processes of pharmaceutical development. He is also an early investor in Space-X, which did the same thing to the moribund technologies of satellite launch. Also, like Space-X, Stemcentrx has an extensive in-house capacity for prototyping and production. Presently this company has very high level biotechnologists, a “vivarium” with 18,000 experimental mice, and a factory for producing their experimental drugs. Investigations of at least 10 types of cancer are in their plans for the next two years. Almost no development takes place outside using other facilities or subcontractors. Space-X has a similar centralized production model. The key advantage of this is that you keep the engineers close to the production teams, and therefore avoid misunderstandings between theory and practice. You also are more capable of producing things in house quickly without having to depend on outside resources. It’s also vital in keeping trade secrets in-house. This same model was used by Lockheed “Skunk Works” for advanced aircraft development for the last fifty years. Earlier examples include R. G. LeTourneau, who used a similar method to develop advanced earthmoving equipment in the mid-twentieth century. R. G. LeTourneau. Mover of Men and Mountains, Page 239. Will they cure cancer, or at least some varieties of what that broad term describes? It seems quite likely they will either solve some cancers, or find out much more quickly than their peers that they should find a new hypothesis. There are really three keys to their potential success– the stem cell theory, the rapid-development methodology producing accurate results, and the lab infrastructure to test the theory using the methodology. Theories, being “form”, are essentially “free”. Labs are material and expensive. Methodologies are somewhere in between, because your methods dictate your equipment and skill sets. They could be wrong in their theory, but they could rapidly adjust and preserve their investment in development methodology and testing hardware by applying a revised or entirely novel theory. They are leveraged correctly to advance quickly, right or wrong. At any rate, bear these lessons in mind. They are worth knowing, regardless as to whether your moon shot efforts are literal or metaphorical. UPDATE: In the time since this was originally published online on February 6, 2016, AbbVie bought Stemcentrx. Then, Kent has started a contract at AbbVie working on marketing platforms. Then, Nadya got a full time job as a research scientist at AbbVie working with tumors in mice. For this reason, we won’t update or discuss the content of this article relative to Stemcentrx for the foreseeable future due to non-disclosure agreements.